And Crick Boat Show is where we are on the Saturday, Sunday and Monday. 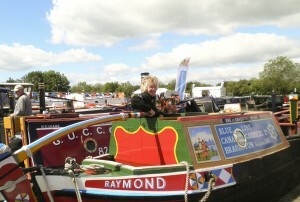 This was all planned with the boating holiday on the Black Prince boat in mind. When we got WRT we decided we still would attend the boat show, but now with a list of things for our own boat. The tickets were paid for, and a nearby hotel was already booked. These three days are definitely part of our learning curve. It is the chapter: How to cope with rain and excess mud. As for the rain, I also buy a boater’s hat (and I think it suits me), which keeps my hair and my glasses dry. And for the mud… Well, we learn to ignore it. We buy a fridge that fits. It will be delivered to Scarisbrick Marina next Thursday. We attend a RCR seminar about engine maintenance, realise that (being a member of RCR) we are entitled to an engine check every year, and book an appointment with Trevor, to check the engine, also next Thursday. We order Venetian blinds for the bathroom and the galley, to replace the roll-up blinds that, when rolled down, hang somewhere in the middle of the boat. And have a look at a system for the side doors, that has a flyscreen for the summer and a perspex panel to keep out the draught for the winter. We buy a whirley that sits on the tiller, a trolley to transport our toilet cassettes to the Elsan points, brass polishing material, tools for the solid fuel stove (my old ones are almost twice the height of our stove) and speak to Caldwells (the manufacturer of our windows) about the broken down catches. Except for a proper boater’s hat I achieve something else: I start drinking real ale, instead of red wine. The music marquee is the place for a real ale and cider festival, and since the scrumpy cider (the kind I used to drink and like at Sidmouth Folk Festival) is sold out, I turn to real ale. It’s also a lot cheaper in an UK pub than red wine. The music marquee reminds me of Sidmouth anyway. I really enjoy the performances of a Cajun Band; I even teach my neighbours how to dance a Cajun Twostep.